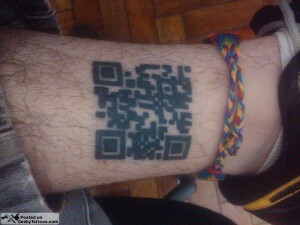 We’re taking a step from the invisible to the highly visible – QR Codes designed to make an impact. Your favorite Android QR scanner can help you rock out. Is that dedication to your craft, or what? We found another example of dedication: these cows in England help promote the UK dairy industry. How? The barcode on the side of Lady Shamrock has made her a local celebrity. Her milk is used to make the famous local Stilton cheese. 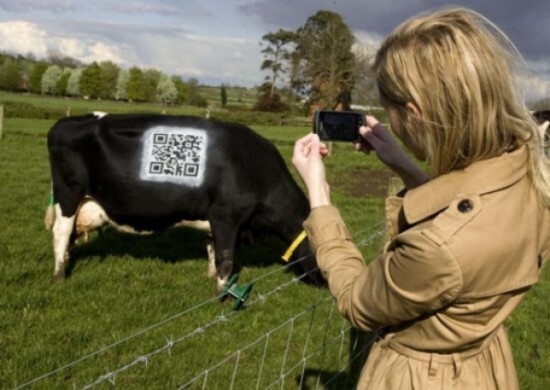 The QR Code resolves to a website where interested humans can use their favorite zapper app to learn more about how Lady Shamrock is cared for, her daily milking routines, and dairy production in the region. “If we don’t look after our dairy farmers we are not going to be able to see dairy cows grazing in our beautiful English countryside,” said the farmer who is milking this idea. Britons can use their Zapper Scanner barcode reader for iPhone or iPad to learn more. Caption: Britons can use their Zapper Scanner barcode reader for iPhone or iPad to learn more. And when Facebook moved to new headquarters in Menlo Park, employees were encouraged to participate in a “Space Hackathon,” to make the new place feel like home. Employees took the challenge seriously by tagging the walls and hanging posters. One employee organized a 42 foot (nearly 13 meter) -wide QR Code on the roof. It’s visible from space. 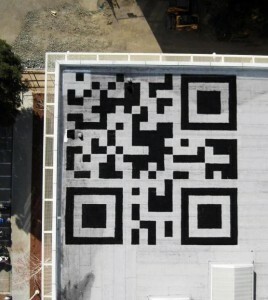 Use your iPhone QR Code reader from space: it’s scannable from there. From the invisible to the highly visible, QR Codes take you where you want to go.